13 Dramatic Paintings of Storms > No stranger to painting directly from nature, J. M. W. Turner went to extraordinary lengths to capture its fury in “Snow Storm – Steam Boat off a Harbour’s Mouth.” As the story goes, the 64-year-old artist had sailors lash him to a steamship’s mast for four hours in the midst of a raging storm so that he could experience its effects firsthand and — if he survived — to record the scene later on canvas. Today’s artists find similar inspiration in the dark skies, voluptuous cloud forms, and dramatic colors of storms. Although none of the artists featured here went to the extreme measures Turner did, all were driven to brave the elements to commit the scenes directly to their painting surfaces, make quick sketches or studies, or, as circumstances dictated for one, simply to burn the imagery into her memory to serve as inspiration as soon as she got to her easel. “I painted this scene during the 2017 Olmsted Plein Air Invitational in Atlanta, Georgia,” says Vladislav Yeliseyev. “Just before the event started, a fire caused a bridge to collapse on one of the most heavily traveled highways in the city. As if that wasn’t enough, a terrible storm rolled in one morning that had radio and television newscasters advising residents to take shelter with the threat of a tornado warning. That’s when I knew I needed to go out and paint. “Storm clouds are prominent in many of my paintings,” says Jill Basham. “I find them to be poetic, dramatic, and incredibly moving. In order for the clouds to take center stage, I often simplify the land or water below. I work to give the viewer a glimpse into the feelings that I get from what I see. I help to convey the mood with the level of energy I use to apply each brushstroke in the storm clouds. I’m fortunate to live on the Eastern Shore of Maryland, where the horizon line is quite flat, and storm watching and cloud painting are at their best. 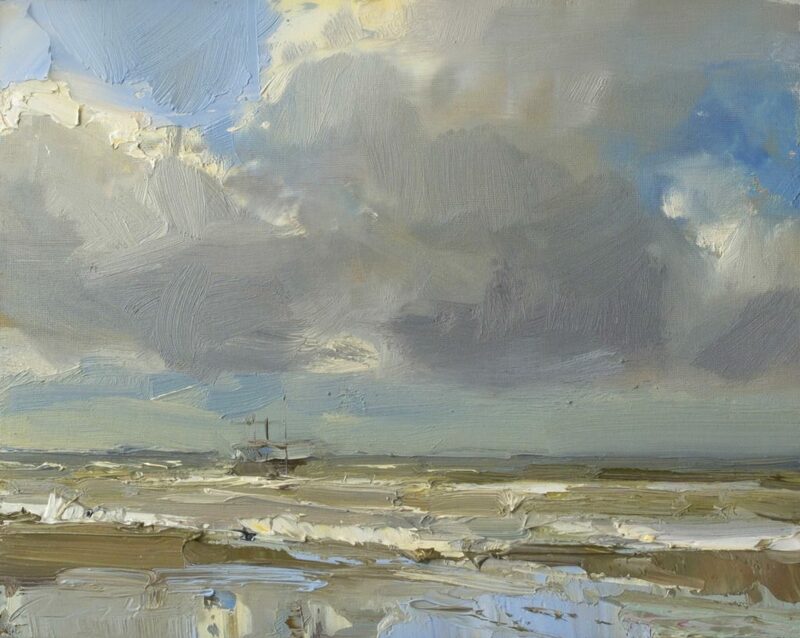 Roos Schuring, “Seascape Shrimp Boat and Stormy Day,” 2017, oil, 9 1/2 x 12 in. “In Southern Holland, the beach is an important part of life,” says Roos Schuring. “The Dutch don’t fear a stormy day; they walk their dogs, fly kites, or go to the beach to enjoy the cold breeze and wild waves. In summer it’s a different story, but for 75 percent of the year, it can get cold, rough, and certainly not ‘ideal’ for painting outdoors. There’s a (good) chance for rain most of the time. “Eventually, I got tired of watching weather forecasts to decide whether or not to go painting. I created a schedule and committed to going out no matter the circumstances. I’ve painted in the roughest of storms, slapped in the face a thousand times by my own jacket while working. I secure my easel with bags of sand, and staple the canvas to my easel. Of course, in a storm, a painting umbrella is useless. “Inspired by the New England marsh paintings of Martin Johnson Heade [American, 1819–1904], I set out to find the exact spot of one of the locations he was known to have painted on the South Shore of Boston, near where I live,” says Liz Haywood-Sullivan. “Using Google Maps to review the current marshes from above, I was able to pinpoint the man-made channels created a century ago to allow for boat access. In the 139-year gap between our paintings, the industry along the marshes and their rivers has changed from salt haying to recreational pursuits, but the essential geography and magnificent sky vistas remain timeless. “Heade’s marsh paintings exhibit a number of consistencies that I incorporated into my painting. They are horizontal, usually 1:2 proportionally. The horizon line often sits at the lower third, so the paintings focus on a dramatic sky, which is often stormy. Occasionally, a peek of blue sky appears through the storm clouds at the very top of the picture plane. “I did numerous sketches of this piece on location with a view of the marsh and the North River looking east toward the Atlantic Ocean, at the dramatic end of day. Although the iconic salt marsh haystacks are gone, I included mooring posts, a clue to the area’s past, which also served to add a contemporary vertical interest to the horizontal image. “I love painting tornadoes, lightning, and dust storms,” says Iva Morris. “I live in rural New Mexico, so I have plenty of opportunities to ‘explore’ extreme weather. I also cross the country once or twice a year and camp on the way. When translating these weather events into a two-dimensional painting in my studio, I start by preparing a textured surface — sanded paper on Gatorboard, covered in a ground of pastel and turpentine. I like to build up thin, transparent layers in order to create the dense atmosphere of dust, wind, and debris. I have painted plein air near tornadoes, a water spout, tropical depressions, in the eye of a hurricane and in winter snow storms. So many events have had severe weather alerts and rain that it has become the responsibility of the plein air competition artist to have inclement weather painting skills. Please also see oils of storms by Amy Marx.